When Phil Rodenbeck of Visitor Watches set to work, he wanted to do something different. "When designing a watch, there is a temptation to do something like what you have in your collection." He explained. "I didn't want to do a watch I already had. I wanted to do a watch I had never seen." After my review of the Visitor Calligraph Duneshore, I can say he achieved this objective and has created something truly unique. An engineer by trade, Phil has worked in the gas turbine and automotive industries. He began to notice what the senior engineers were wearing, and discovered the mechanical marvel that is the automatic movement. Like most of us, the more he learned, the deeper he got. Eventually, he became enamored with the idea of making his own. "I wanted to design a machine from top to bottom." He said. 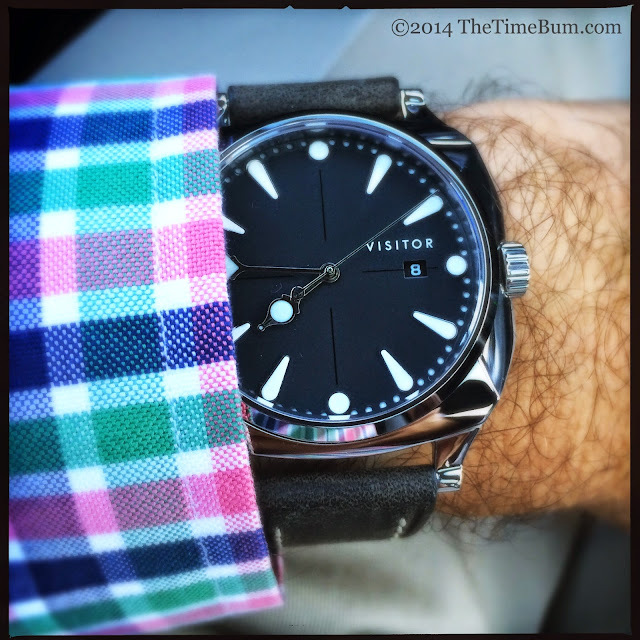 "A car would have been great, but watches are a lot more manageable!" The Visitor name comes from Phil's experiences traveling abroad, and his attraction to the exotic. As Phil describes it, "When you are a visitor, are an unknown to those around you. You are also outside of your own comfort zone, and unfamiliar in your surroundings, which makes you more open to new things." 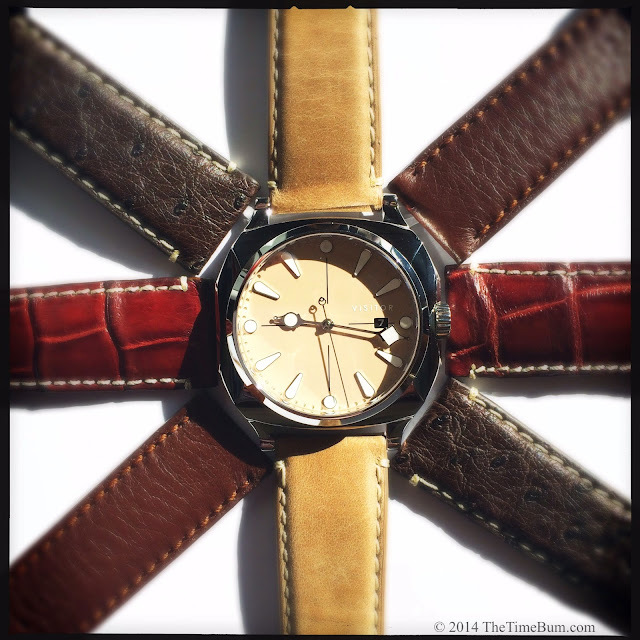 Have you ever owned a watch with a faceted cushion case? I'm betting the answer is no, because I just made that up. There is really no adequate descriptor for its case, the likes of which I have not seen before. It is a three piece design, 44mm wide with beveled and scalloped edges that peak at the corners and dip low towards the middle, surrounding a broad central barrel, and curved exhibition case back, all securely screwed together. This undulating shape was inspired by the shifting sands of the Indian Dunes National Lakeshore. The lugs taper dramatically and terminate in a rounded tip, drilled through for easy spring pin removal. The whole thing is mirror polished, which makes it a beauty to behold, and royal pain to photograph, as the curves and angles create a complex network of reflections. The case may appear organic or industrial, depending on your viewing angle. 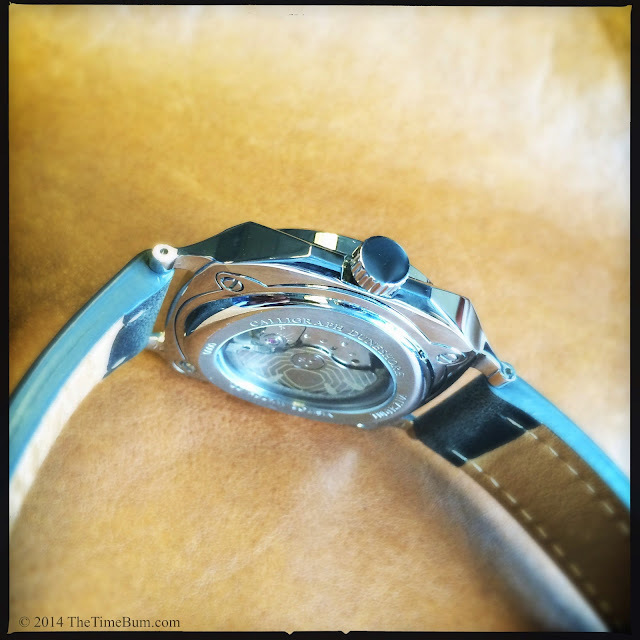 The back of the watch is as eccentric as the front. Phil drew his inspiration from Chicago's Cloud Gate structure in Millennium Park, affectionately known as "The Bean." It is plump and polished with a brushed, convex ring engraved with the company name, model, serial number, and "Indie.Ana," a reference to Visitor's home state. The window's crystal is set flush and curved to conform to the case. It looks fantastic and provides some interesting distortions when viewed off-axis. Through the window, you will see a Miyota 9015, a reliable, high beat (28.8k bph) automatic movement with hacking and hand winding capabilities. This usually prosaic unit has been dressed up with a custom engraved rotor. 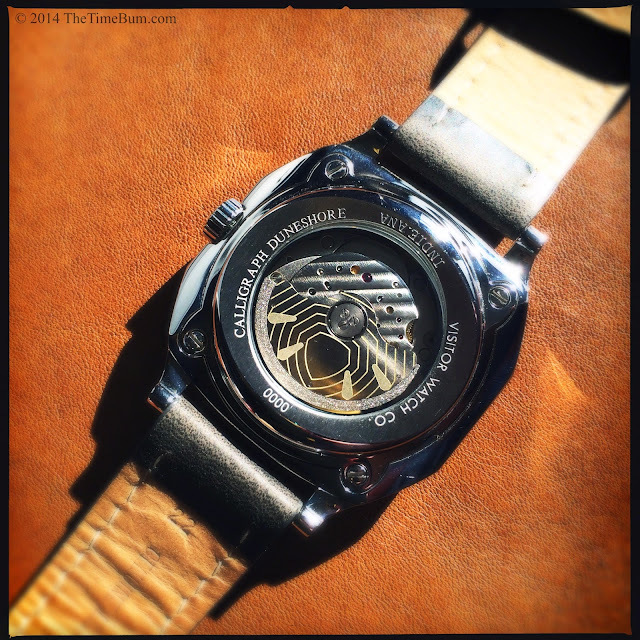 The prototype had only a radiating shield pattern and oblong shapes that mirror the hour markers on the dial. On the production version, the shield will be filled with the lion's head design displayed on the website. 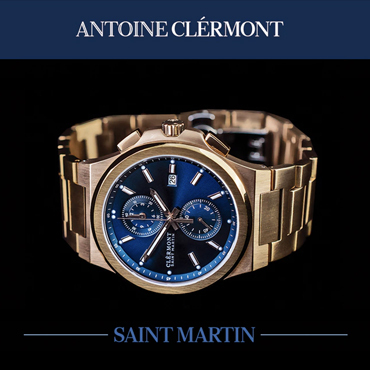 Many watch aficionados are also pen collectors, and to them, the watch will be especially appealing. "Calligraph" is an archaic verb meaning "to write calligraphy." Phil also interprets the word as "to communicate beautifully," one of his objectives when designing the watch. The pen motif is cleverly incorporated and not so obvious as to make the watch a novelty piece. It is most apparent in the shape of the hour hand, but if you view the lugs in profile, you will discover a nib shape in that form as well. 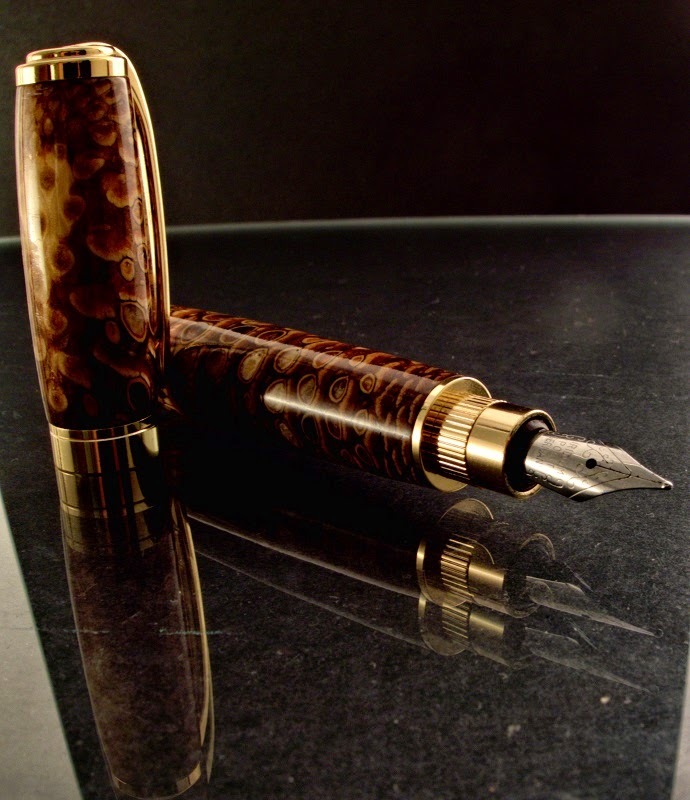 Visitor also has a lovely fountain pen in the works that is crafted from pine cone and looks amzaing. As pretty as it may be, the watch is also surprisingly functional. It has a flat sapphire crystal with internal anti-reflective coating. The polished, 7mm crown at 3 o'clock screws down. The crown is undecorated on the prototype. Phil has not decided whether the production model will be signed, but I hope it is. Water resistance is a healthy 100 meters. At night, the dial lights up with BGW9 SuperLuminova. The Duneshore is hardly a tool watch, but it far more practical than most dress watches. It is a large watch, but not overwhelming. The overall lug-to-lug length at 51mm, and it is only 11.75mm from case back to crystal, so it fit within the confines of my 6.5" wrist and slipped under most shirt cuffs without effort. The deep scalloping around the case also helps camouflage its size, as do the small lugs and curved case. 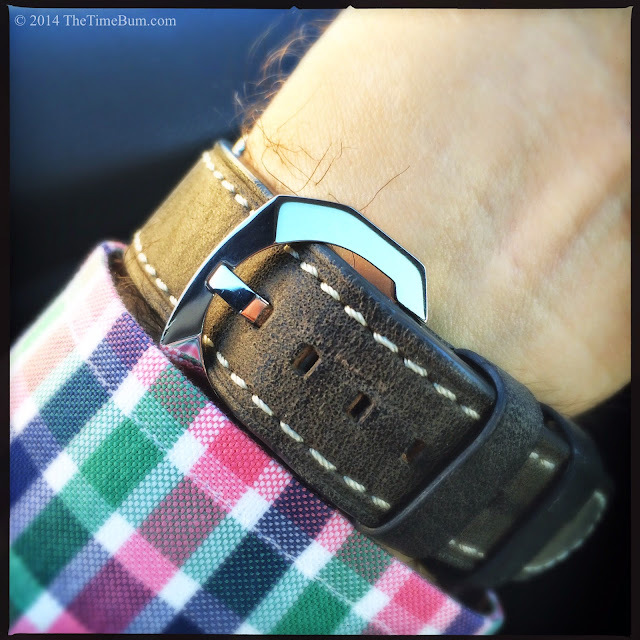 The watch seems to fall away from the dial and wrap around your wrist. In many ways, it reminded me a 45mm Panerai Radiomir. 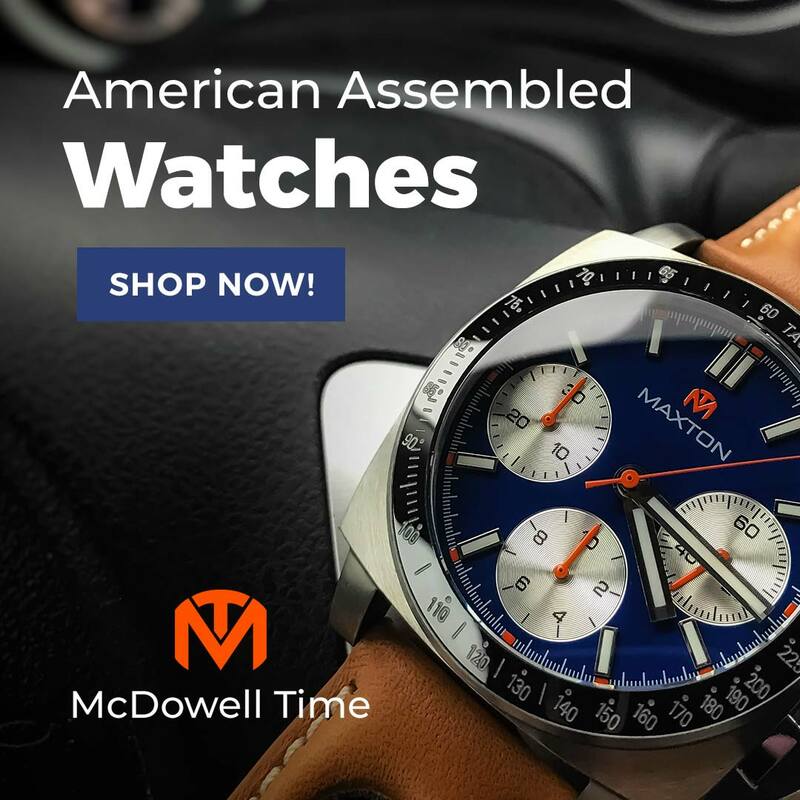 Obviously, these are two vastly different watches, but both have large cases engineered to gracefully minimize their bulk and appear much smaller on the wrist than one would expect. I also think both watches occupy a niche somewhere between casual and dress. 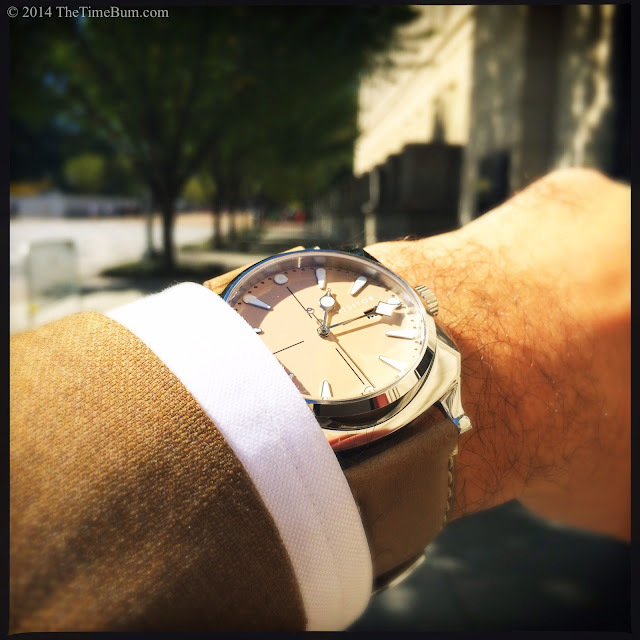 Time Bum readers know my position on bulky watches with formal wear, but I have a liberal view when it comes to business dress. I have seen some rather dapper fellows pull off a Radiomir with a suit, and I found I could do the same with the Visitor. The watch can dress down too, but not too far. It will look out of place with torn jeans and a Ramones tee shirt (or whatever you kids are listening to these days) but perfectly at home with loafers and a button down shirt. For all of the drama in the case design, the dial is elegantly restrained. It strikes a harmonious balance, preventing the watch from slipping too far into the Baroque. 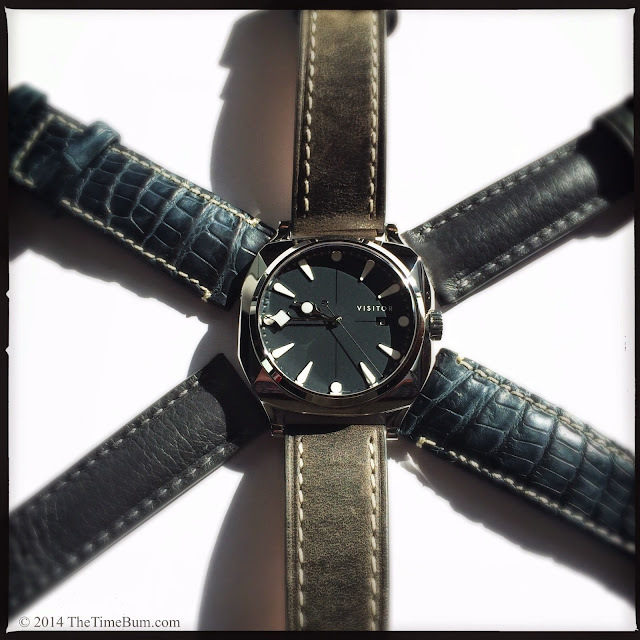 The expansive dial is available in Beach (tan), Blue Slate (dark blue-grey), and Forest Ore (dark green). 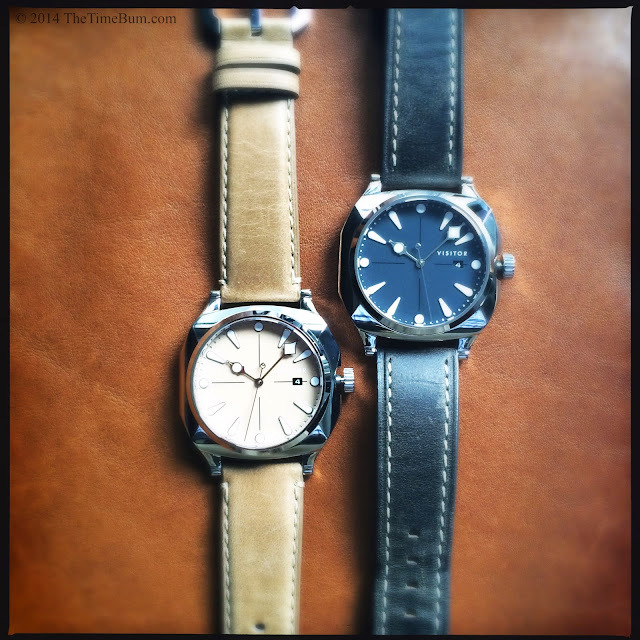 The finished prototypes were Beach and Slate, while the Forest Ore dial was uncased. All three colors were lovely and suited the exotic design better than more predicable black or while dials. The dial is ringed with large, applied makers that are polished and lume filled. Circles are set at 12, 3, 6, and 9, and oblong darts represent the remainders. There is a black date disc in a 3 0'clock window, with lume painted numbers. Yes, you read that right. This custom disc is lumed. The Visitor band is positioned above it. You will be forgiven if you not immediately notice that this is a sandwich dial, but direct your eye to the perimeter and you will be rewarded with a view of the perforated index, revealing a layer of lume below. The center of the dial is left open and uncrowded, with just a simple printed cross hair to pull it all together. The hand set is an fanciful affair, with needle-thin sticks topped with bulbous, lumed heads. As mentioned above, the hour and minute hands both shaped like the nib of a fountain pen. They are differentiated by shape and length. The minute hand is more of a diamond shape, while the hour hand is rounder and appears to have an ink channel. The second hand is polished with an open loop at the tail. It is a whimsical design that suits the rest of the watch perfectly. The large heads are properly proportioned within the dial, and their ornate shapes match the peak and sway of the case. The hands are also my one point of criticism. I found the shapes to be too similar, and their stems too thin. It presented no problem when reading in daylight, but I found I lost the hands on the darker dial when the light grew dim. 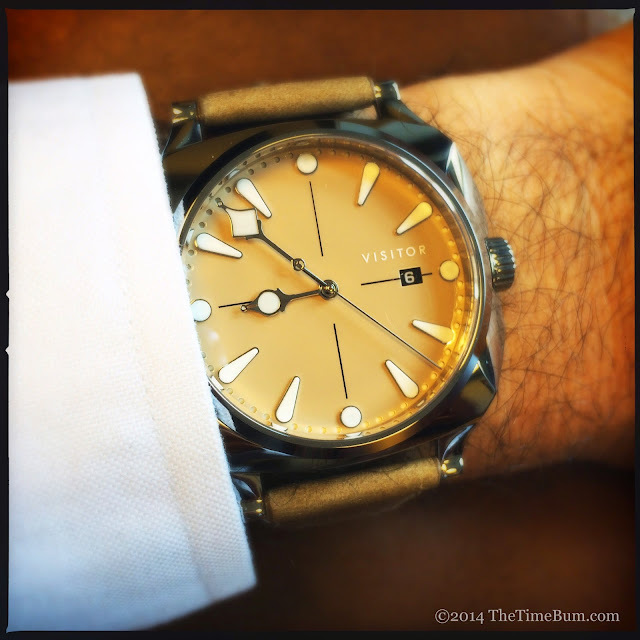 The lighter, sand colored dial presented no problem. At night, the dial pops to life. 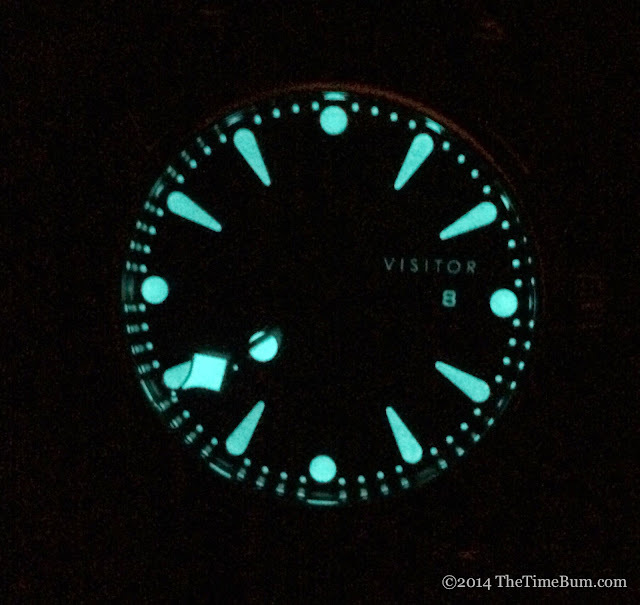 Phil apologized for the lume, and promised that the production version will be brighter, but I was blown away. The blue green glow is strong and clean. The shapes of the hands are clearly defined, and the layered index is stunning as it reflects off of the polished surface surrounding it. Even the date is legible. The Calligraph Duneshore will launch on Kickstarter on November 3. Early birds will be able to purchase one for $480 and the price will top out at $520. After the campaign concludes, MSRP will be $650. The total package will include the watch on a deerskin strap, carrying case, cleaning cloth, and strap tool, with the aforementioned extra straps if stretch goals are met. 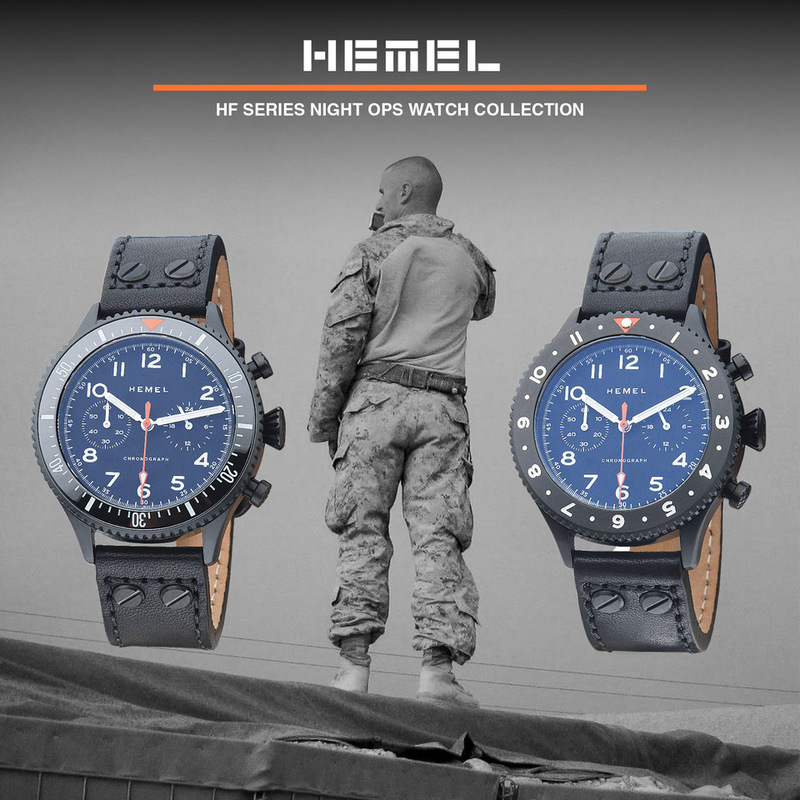 I am excited to see this watch launch, and fervently hope is succeeds. 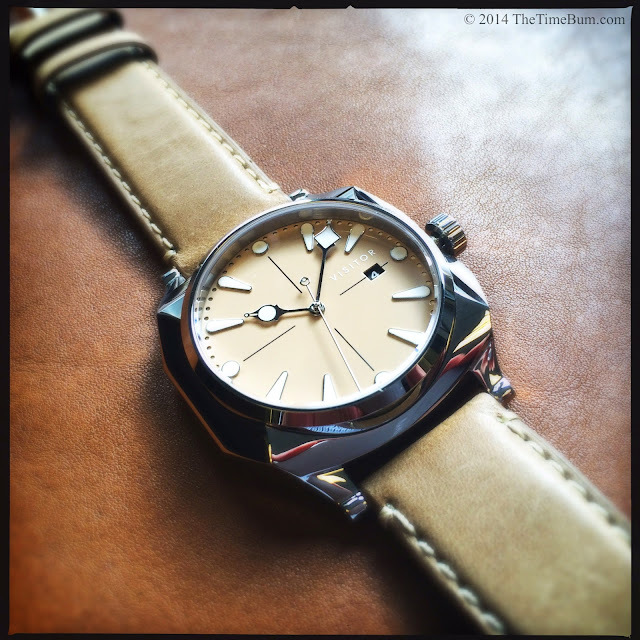 Kickstarter has provided fertile ground for watch projects, but only a few are really special. The Visitor project is one of them. 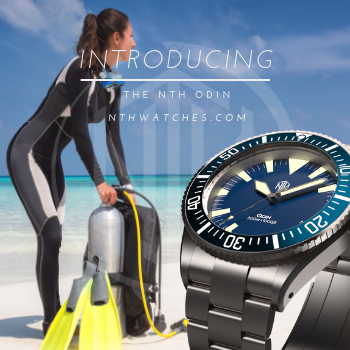 Phil has created something truly unique and beguilingly attractive, with solid specifications, and a quality movement, and has done so at an eminently reasonable price. As I always say, crowd funded pre orders can be slippery things. There is always the risk of change, delay, or a failure to launch. That said, I suggest you have a good look at the Calligraph Duneshore, if for no other reason, than to see what a truly talented industrial designer can accomplish. Con: Easy to lose the thin hands against the dark dial at twilight. Sum: I love it. The Time Bum swoons.